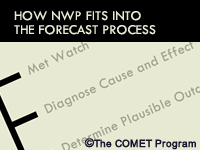 This introductory module presents the basis for the other modules in the new NWP Series: Effective Use of NWP in the Forecast Process. We present the four steps in the forecast process, as determined by best practices in U.S. National Weather Service (NWS) Weather Forecast Offices (WFOs). Then we show the module topics and summarize how to navigate through the course. Identify the steps in the suggested forecast process. List the modules in unit 3 and explain what they will cover.